Whether you are renovating, moving from one home to another, clearing out a loved one’s home or just getting rid of belongings you no longer want, you need a way to get rid of all the rubbish. Here at MCM Skip Bins, we do everything we can to make this process easy. 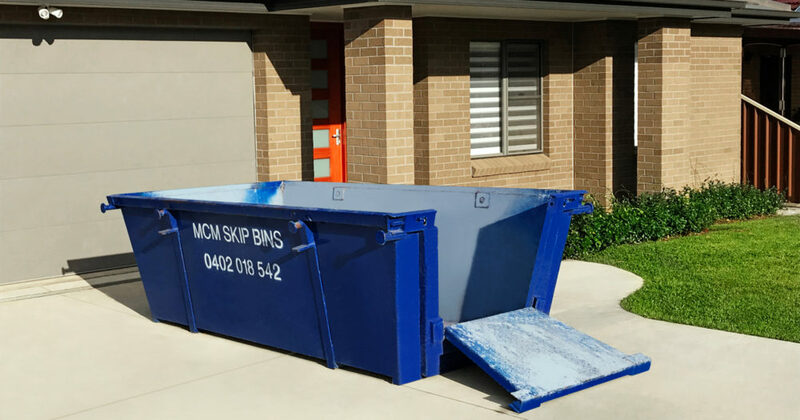 We provide skip bins for hire in the Sutherland Shire and St George Area to help you get rid of any waste that needs to be taken away. We don’t want you to have to pay for any more than what you truly need. That is why we offer skip bins in a variety of sizes, from three cubic metres up to eight cubic metres. If you are unsure as to which size skip you need, our team can advise you. Based on more than a decade of experience in this industry, we know all the right questions to ask to determine the most appropriate skip size to meet your needs. We pride ourselves on our customer service and will be right there with you every step of the way. From the moment you get in touch with us, we will be on hand to answer all your questions ensuring you have all the information you need in hiring a skip bin. As we are family-owned, our customers are the most important aspect of our business, and you will feel valued right from the start. Whether you live in a single-family home, townhouses or an apartment building, we can get a skip bin to you. We maintain a hooklift truck in our fleet to place skip bins in low clearance or tight spaces. We offer skip bins with rear opening doors for easy access and convenient loading. We understand that placement of your bin can be really important. Placing your skip bin as close as possible to your residence or near the area being worked on is essential for easy loading. When it comes to skip bins themselves, there is not much to distinguish one from another. This is why we put the focus on distinguishing ourselves through our interactions with our customers. Our drivers are always friendly and respectful, and they’ll take the time to address any questions or concerns you may have. We work hard to do everything possible to ensure you are completely satisfied with the service you receive from us. In many cases, we can provide skip bins on a moment’s notice. This way, you can get rid of your rubbish at a time that is most convenient for you. You may need to reserve your skip the night before for AM deliveries or pick-ups. As is to be expected, weekends tend to be busier for us, so it is best to call in advance to ensure you can get a skip at your preferred time. We’ll do everything we can to get a bin to your location at the desired time.